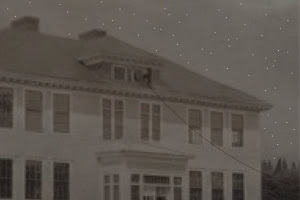 This is a special story entitled “Let’s Put a Rope on the Bell” about Growin’ Up in Maine in 1928, and features a story contributed by a new reader, Larry Hall. Mr. Hall was born in 1916 in my home town of Derby, and attended the Derby Grammar School (see photo and rope) from 1923-1931. After exchanging emails, we spoke by phone, and he agreed to let me record his story, so now readers can listen to his narration instead of reading. During our conversation, I suggested the theme of “Ten Decades of Stories”, and we may collaborate on a new blog that features exclusive stories by Mr. Hall in the near future. Meanwhile, close your eyes and imagine sitting in a rocker outside an old general store as you listen to Larry Hall tell about roping the grammar school bell in 1928, plus a bonus piece about the Sheriff’s Model T Ford. You are encouraged to bookmark this page and tell a friend, leave comments on this blog, or email me from any page with feedback about producing more audio stories recorded by Larry Hall. Thank you, Larry, for sharing memories of what it was like Growin’ Up in Maine in 1928.